Click the ‘Create a Document’ button to open the editor and start writing a document. SymWriter 2 users will be used to pressing the ‘F11’ key as a shortcut. To perform this shortcut in Widgit Online you must also hold down the ‘Alt’ key: Alt + F11. 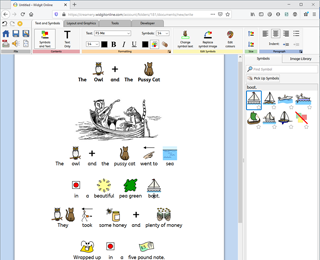 You can also use the Change symbol text button on the toolbar, or the Change symbol text option from the context menu, accessed by right-clicking on the symbol. The 'Graphics Browser' has been replaced by the Insert Picture button on the toolbar. You can click this button to add your own photos and images, or to add a symbol as an illustration. You can click the Replace Symbol button on the toolbar to upload your own image as a replacement symbol for a word. You can also use the Replace symbol option from the context menu, accessed by right-clicking on the symbol. Note: Please only upload images that you have permission to use, especially if the document containing them will be published. Many of the symbols in the Widgit set have skin tones associated with them. 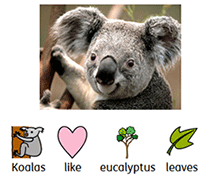 These symbols can be customised with a skin tone of your choice. Select the content you wish to change and press the skin tone button on the toolbar. This will display a dialogue box allowing you to choose from one of the six pre-set options. A Page Break forces any content following it to start on the next page of the document. They are particularly useful for separating continuous content across two pages. You can find the Page Break option on the toolbar when you are creating documents. You can add links to other webpages within your document using the link icon. These links could be to other Widgit Online documents or to other websites. 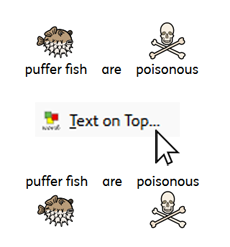 Click on the single speaker icon to listen to the selected sentence read aloud. Click it again to hear the 'next' sentence. To play the last sentence again, click the repeat speech icon. To choose a different voice for text-to-speech output or adjust the speed of the voice, select Speech Settings. If you have a microphone connected to your device, you can use the Speech Input option to add text to your document. 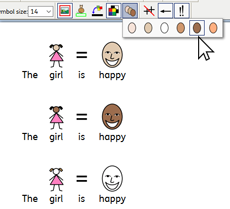 Click on the Speech Input icon to enter speech input mode. You can now speak into your device's microphone to input words into your document. Click OK or Cancel to exit speech input mode. Note: The Speech Input feature is currently only available for use with the Chrome Web browser. There are a number of fonts available in Widgit Online. The default font is FS Me, which was designed by Fontsmith and endorsed by Mencap to aid legibility for those with learning disabilities. 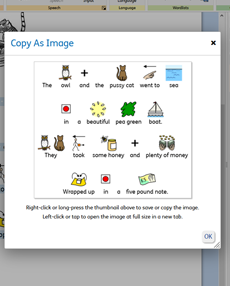 The Open Dyslexic font has been added to Widgit Online. This font has been created to increase readability for readers with dyslexia. For more information, see opendyslexic.org. The PractiseWriting font is a modified version of Raleway Dots (copyright and licence). If you would like export a symbol snippet into a third party application, such as Microsoft Word or PowerPoint, you can select the content you wish to copy, then click the Copy As Image option from the Edit drop down menu. The default setting is to display symbols above the text that you type, however, you may choose to display text on top of symbols. From the dialogue that appears you can choose to change the text position as well as select your default option. You can print your documents from the editor. This generates a PDF document that will open in a new tab. From this you can use your browsers functions to print. Note: Trial versions of Widgit Online have a watermark on PDF documents. PDFs created from a full account do not have a watermark. You can change the page setting in the File menu - Page Setup. You can set your document to be in A4 or US Letter size. You can also change the orientation to Landscape or Portrait. PDFs created from your document will use these settings.